I am happy to feature my friend Shila Cheadle as the second Natural of "A Hair Story". She was so kind to let me interview her on her lovely Hair Journey. If you would like to ask Shila anything, you can reach her through FaceBook. Natural Expression: How long have you been Natural? Shila: I have been natural since April of 2010. Natural Expression: What made you start your Natural Hair Journey? Shila: My decision to go natural wasn't for any particular reason. I went natural simply because I wanted too. It was something I've always wanted to do and I knew that at the right moment I would do it, without hesitation. Shila: I'm very versatile when it comes to my hair. So before making the big chop, I decided to rock a short hairstyle (mo-hawk, with shaved sides) for awhile. Eventually, with maybe 2 inches of new growth, I cut all the perm out and started my natural journey. Natural Expression: What are your thoughts on Natural Hair? 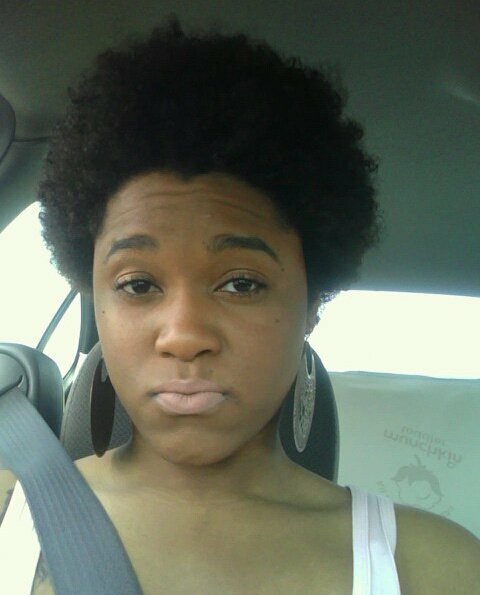 Shila: India Arie said it best, "I am not my hair!" Being natural is a beautiful thing, for me, this is the way my hair is suppose to be. And I tell people everyday, this is who I am, it may look "nappy" to you but to me it's perfect! It's a choice, embrace your beauty, whether it be natural or relaxed. Natural Expression: Did going natural change you in any way? Natural Expression: What would you tell someone who's considering natural hair? And why they should? Shila: I would say, "DO IT!" My slogan is Chemical Free, Is The Way To Be! It's less expensive, healthy, fun, free, and just damn great! Most importantly be positive, always do what makes you happy! If it's relaxed hair so be it, if it's natural hair power to you! Natural Expression: What products are you currently using? Natural Expression: What's your hair regimen now & your favorite hair style? Shila: I don't wash (shampoo) my hair often, but I do co-wash once a week. 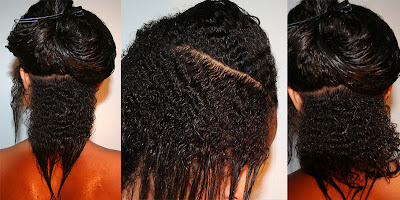 A hot oil treatment is done every month, no heat (sit-under blow-dryer), the oil gets hot when in contact with water. Because I have dyed my hair a few times (I don't suggest this), my hair is often dry at times, so I always keep my handy dandy spray bottle in reach with a mixture of water, olive oil, Shea butter, and other oils to keep it moisturized. My favorite hair style is Bantu/Zulu knots! !